Makeup, Beauty and More: What Are Your Favorite Deep Cleansing Masks? What Are Your Favorite Deep Cleansing Masks? I've been quite wary of most deep cleansing/detox masks in the winter as my skin gets terribly dry, but I started breaking out quite a bit along my chin recently, so I got around to trying a couple of them and absolutely love them both - The Origins Clear Improvement™ Active Charcoal Mask and Wei Golden Root Purifying Mud Mask. 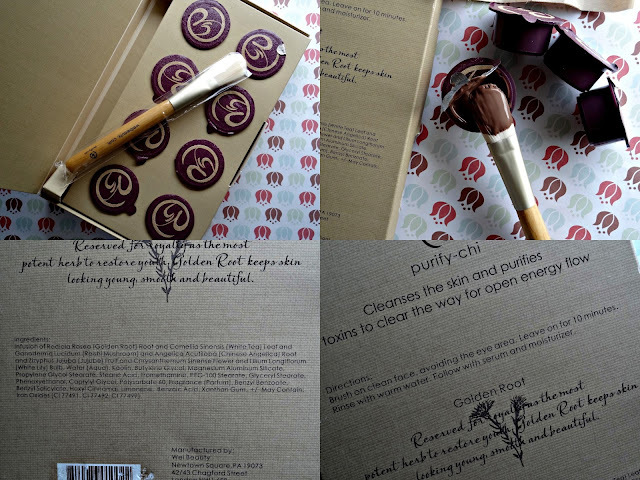 Wei Golden Root Purifying Mud Mask ($42, Press Sample) - This one is more of a purifying mask that leaves skin smooth, clean and bright. The masks come packaged in eight small disposable containers, containing 8ml each. I get about two uses from each of them, so I seal it up tightly and store to prevent the mask from drying out. The brush that comes along is fantastic - I just scoop some with the brush, apply a thick layer and leave it on until it dries. There's a slight tingle that calms down after a couple of minutes and the mask washes off clean. It is a mud mask after all, so my skin feels a tad dry, surprisingly less drier than I expected it to. Following up with a good hydrating serum/moisturizer is recommended. Pricey, but a great, detox mask for all skin types that brightens & refreshes! Origins Clear Improvement™ Active Charcoal Mask ($23) - If you want something a little more stronger, something that cleans pore-deep and gets rid of every last bit of gunk, the Origins Clear Improvement™ Active Charcoal Mask is perfect. I was't planning on trying this until summer, but my skin was going through a bad phase with a lot of breakouts and my pores were more clogged than ever, so I picked this up recently. It is a tad drying, but nothing a good moisturizer can't fix. That aside, it is fabulous - my skin feels super clean and pores look slightly smaller. Every time I apply a serum after I cleanse this off, I can feel a slight tingle! I use this once a week or once in ten days and sometimes only on targeted/problematic areas. Have you tried any of these face masks? What are your favorite deep cleansing/detox masks? Disclosure: Wei Beauty Mask provided by PR; Origins bought by me. Hey were you the one who told me about tawa pulao? I have been making it every other week now - so easy peasy and quite tasty too!